Most commercial applications of absorption for gas control fall into two categories: regenerative and nonregenerative systems. For regenerative systems, the solvent leaving the absorber is enriched in pollutant. This mixture is normally separated by distillation. 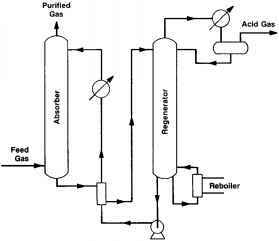 The solvent is then recycled back to the absorber, and the pollutant can be recovered in a concentrated form. Regeneration is possible when the absorber uses a physical solvent or a solvent containing compounds that react reversibly with the pollutant. The recovery of H2S from hydrocarbon processing using an amine as the solvent is a major application of regenerative absorption. Figure 5.20.4 shows a typical flowsheet. For the capture of H2S and volatile sulfur compounds (e.g., thiols, COS, and CS2) released during the transportation of sour liquids, a portable system is required. Am-gas Scrubbing Systems Ltd. (Calgary, Canada) manufactures both portable and stationary units that use 26% aqueous ammonia. The spent solution oxidizes to form ammonium sulfate, which is recovered from the spent absorbent and can be marketed as fertilizer. Alternate absorbents for portable units include basic hypochlorite (bleach) solutions, but the stability of the solution decreases with consumption of the base as the H2S is absorbed. A complicating factor in the use of basic fluid absorbent systems is that CO2 is also a weak acid and is absorbed to sequentially form bicarbonate (HCO3) and carbonate (CO|_) ions, thereby consuming the absorbent. The absorption of SO2 by dimethylaniline from offgases at copper, zinc, lead, and nickel smelters is another application. 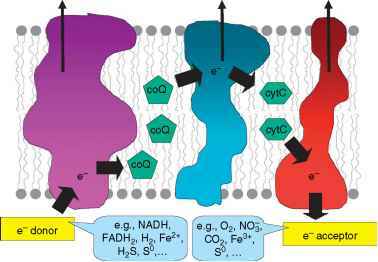 The desorbed SO2 produces H2SO4. The SO2 concentration in the off-gases is approximately 10%. For nonregenerative or throwaway systems, irreversible reactions occur in the liquid phase. The reagents in the solvent are consumed and must be replenished for absorption efficiency. The resulting products are discarded. Typical examples are the absorption of acid gases by caustic solutions. Nonregenerative systems are economical only when the reagents are inexpensive or the volume involved is small. FIG. 5.20.4 Flowsheet for the recovery of H2S using amine as a solvent.